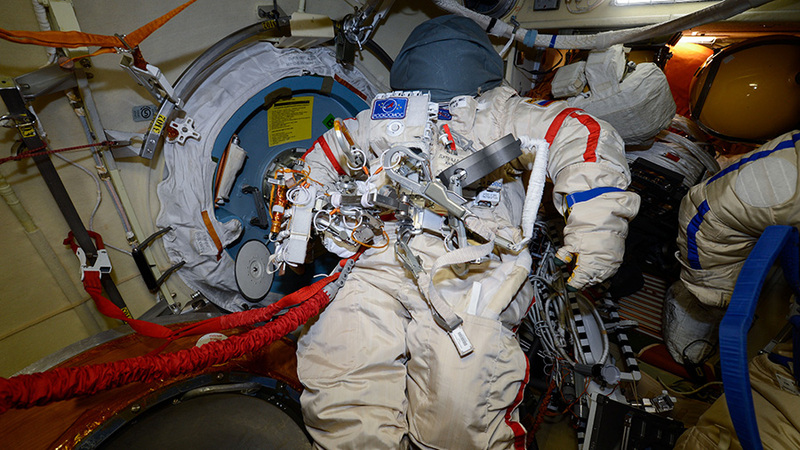 A Russian Orlan spacesuit is pictured inside the Pirs airlock where Russian spacewalks are staged. The Expedition 56 crew is getting ready for a spacewalk Wednesday outside the International Space Station’s Russian segment. Meanwhile, the orbital residents continued apace with space science and preparation for a pair of September spacewalks. Two cosmonauts will suit up inside their Orlan spacesuits and exit the Pirs airlock Wednesday at 11:58 a.m. EDT for about six hours of science and maintenance work. Oleg Artemyev and Sergey Prokopyev will toss four tiny satellites into space, install antennas and cables for the Icarus animal-tracking experiment and collect exposed science experiments. NASA astronauts Drew Feustel, Ricky Arnold and Serena Auñón-Chancellor assisted the cosmonauts throughout Tuesday and reviewed their roles for tomorrow’s spacewalk. NASA TV begins its live spacewalk coverage Wednesday at 11:15 a.m.
Arnold started his morning replacing gear inside the Combustion Integrated Rack then ended his day with plumbing duty on the Water Processing Assembly. Auñón-Chancellor checked on mice being observed for the Rodent Research-7 study that observes how internal microbes impact organisms living in space. Finally, European Space Agency astronaut Alexander Gerst spent the afternoon working on U.S. spacesuits. He, Feustel and Arnold are gearing up for two spacewalks at the end of September to replace batteries on the Port 4 truss structure’s power channels.